Business intelligence is only as good as the data it is analysing. When you consider that 70% of development time is taken up by ETL, that data can often be old and stale. However, to access the freshest data and to obtain the best insights, users often query production databases. This load on the system negatively impacts performance and creates usability issues, as people wait for long periods of time for system responses. The lines of business become frustrated because they can’t make critical decisions rapidly enough and the IT team is overburdened by performance bottlenecks that are hard to resolve. It makes sense then to consider an alternative – one that gets your data to where it needs to be in near real-time. High-Performance data delivery with quick time-to-value, for the widest range of data sources and targets. Change data capture or CDC technology updates your targets with just the information that has actually changed in the source. 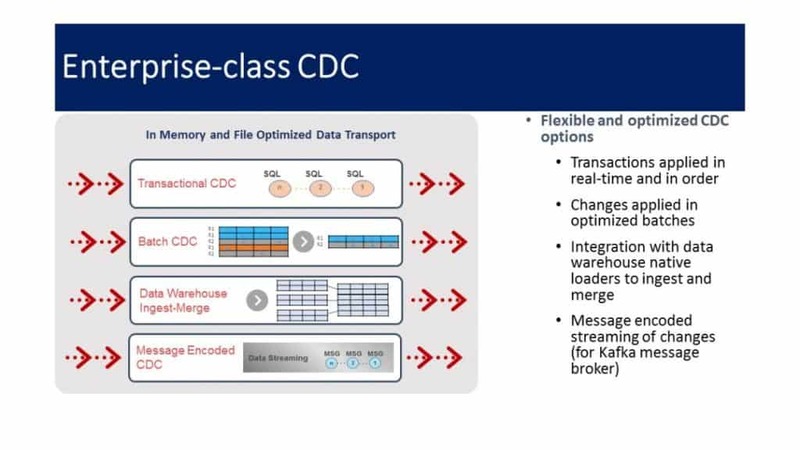 Because these changes often represent only a fraction of the total data volume, CDC products like Attunity Replicate greatly improve efficiency. CDC tools are not created equally. Some use agents on the database servers, while others use stored procedures. Both approaches negatively affect database performance. Attunity Replicate takes a different approach – it drives the data change function off the database log, which means it doesn’t interfere with the database server or add to its load. In addition, Attunity Replicate CDC is designed to significantly enhance data delivery performance and helps improve strategic initiatives including Big Data analytics and business intelligence (BI). By using real-time analytics to develop a more complete view of buyer behaviour, companies can predict and identify opportunities, or even detect and prevent fraud. Creating a separate reporting database to support BI & analytics is a viable option, but only if users can access up-to-date data within it. Unfortunately, this approach breaks down when traditional ETL tools are used to feed information to the reporting database. Attunity software facilitates the creation of operational reporting databases, offloading operational data from production systems into dedicated data stores to support real-time reporting applications. Leveraging Attunity Replicate log-based CDC technology, the solution identifies and captures only the changes made to source systems, minimizing impact on production systems and maximizing efficiency. Furthermore, the Attunity solution works seamlessly with ETL tools, allowing companies to leverage existing investments and extend them to support real time replication across heterogeneous systems. From business intelligence to financial performance and strategy management to analytics applications, Cognos software can provide what an organisation needs to become top-performing and analytics-driven. With products for the individual, workgroup, department, midsize business and large enterprise, Cognos software is designed to help everyone in an organisation make the decisions that achieve better business outcomes—for now and in the future. IBT has been developing and supporting reporting solutions in Cognos applications since the products were first released. We have also built interfaces between external budgeting and scheduling products such as TM1 & Schedule. Gaining an accurate view of the organisation is difficult. Data is stored across multiple, disparate systems and manual data management processes are time- consuming and error-prone. From the executive level to the front lines, efficient decision-making is compromised without dependable, timely data. NetSuite Business Intelligence delivers the power of built-in, real-time financial dashboards, reporting and analysis across all the unified processes within the software suite. Understanding true value-added insights, business users gain instant visibility to identify issues, trends and opportunities and immediately drill down to the underlying transaction to take action. Rex Harrison, CFO, i-solutions Global Ltd.